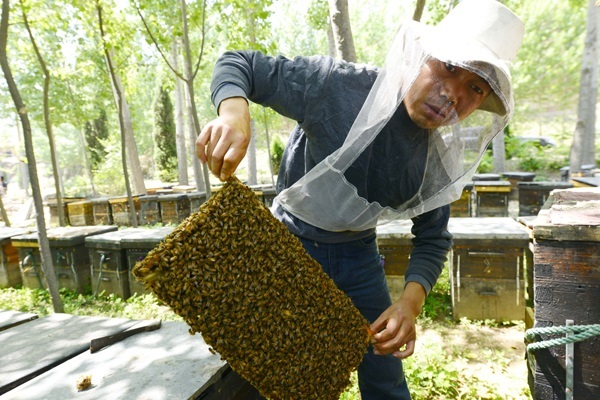 KUNMING -- Chinese researchers have found that honey bee queens have exceptional memory and learning abilities. TAN Ken, a researcher at Xishuangbanna Tropical Botanical Garden (XTBG) under the Chinese Academy of Sciences, said different foods eaten by bee larvae lead to differences in DNA methylation, mechanisms used by cells to control gene expression, between queens and workers. Queens exclusively feed royal jelly, while workers only eat the jelly for the first three days and then mainly feed on pollen and honey, he said. TAN used olfactory learning experiments to test queens and workers and found queens showed excellent learning and memory abilities. At five days old, queens have a memory and learning level that is equivalent to workers at 20 to 25 days of age, he said. The proportion of queens that exhibited learning was five-fold that of workers at every tested age. Bee's exceptional memories are closely connected to DNA methylation, TAN said. The research findings were published in the Journal of Experimental Biology.